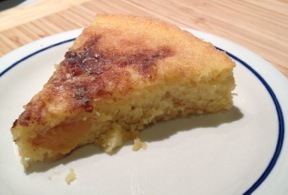 37 Cooks: Have a National Peach Month with Peach Kuchen! Have a National Peach Month with Peach Kuchen! A kuchen is a traditional German cake made of batter and fruit. It's extremely adaptable, and both fresh and dried fruit may be used. Naturally, for National Peach Month peaches would be the star. Any berries or stone fruit may be used as is. Apples, though, should be sliced and cooked until tender before they top the kuchen. Preheat oven to 350˚F. Grease and flour a 9-inch springform pan. Sift together the flour, baking powder, and salt, then set aside. In a large bowl, cream together the butter and sugar until light and fluffy. Beat in the eggs, one at a time, then stir in the vanilla and almond extract. Stir in the flour mixture. Spread batter in prepared springform pan. Arrange peach slices in a spoke pattern over the batter, then sprinkle with sugar and cinnamon. Place the springform pan on a larger rimmed sheet, to catch any possible leak-through. Bake 40-45 minutes, until the top is browned and the cake is cooked through. Heavy fruits will tend to sink through the dough, while berries will remain on top. Let cool at least 20 minutes, then loosen pan, unmold, and serve in wedges. The Dog Days of Summer Heat Picnic!